One of the great things about living in Melbourne is that a pleasant Sunday drive can be undertaken without getting caught in horrendous traffic congestion. As a resident of the northern suburbs, it makes sense to head north and avoid those pesky traffic lights. The Easter weekend weather was perfect, and the four-day break was even better due to the Essendon Bombers defeating the Carlton Blues on Saturday night. And, I consumed more than enough chocolate eggs, so that should keep shopkeepers happy for another year. Bronwyn and I fired up the Ford Falcon on Easter Sunday at 2.30pm and headed for the Macedon Ranges via Sunbury and Romsey. Along the way, we saw a pink gelati van strategically parked near the Melbourne Airport, and it seemed to be catering to the horde of plane spotters congregated in the designated viewing area. Our trip was premeditated because I wanted to enjoy a few hours of photography. Having spent an hour or so on Saturday researching various locations in the Macedon region, I was keen to make a good photograph of Hanging Rock. It’s been a few months between landscape photography shoots due to studies and other stuff, but I remembered aperture settings and how to correctly use my polariser and graduated filters. It was pure bliss to be out and about in the fresh country air taking photographs again. Composition techniques and searching for the angle of light were my photographic priorities whilst driving around looking for interesting subjects. First thing that caught my eye was a vineyard at Hesket, just west of Romsey. The soft autumn sunlight was highlighting the changing colours of the leaves and the eucalypt trees in the background. The shot of the grapevines required a polariser filter to reduce reflections on the leaves, and a 2 stop neutral density graduated filter to reduce the brightness of the sky. I attached my camera on the tripod and used a 70-200mm f/4L lens to compress the scene and attain a tight composition. I took about 10 shots in this location in both landscape and portrait orientation and I’m reasonably pleased with the outcome. After driving around Hanging Rock – which rises 105 metres from the surrounding landscape – I noticed how difficult it is to make an interesting photograph of it. With trees and farm properties in the foreground, I realised I’d have to closely investigate the back roads looking for an interesting angle. Seems the best time to photograph Hanging Rock is at sunrise, so a return journey is in order. 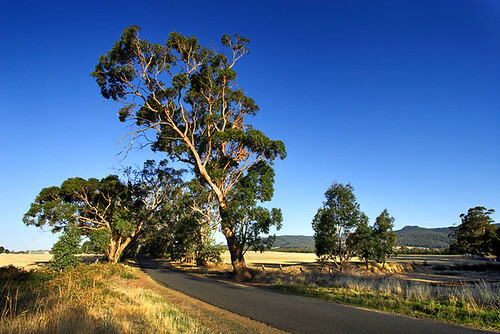 Whilst driving the back roads, I witnessed the sunlight emphasising the trunks and limbs on towering gum trees. Given I’m always looking for leading lines for a photograph, I found a few spots near the village of Newham and began taking shots. 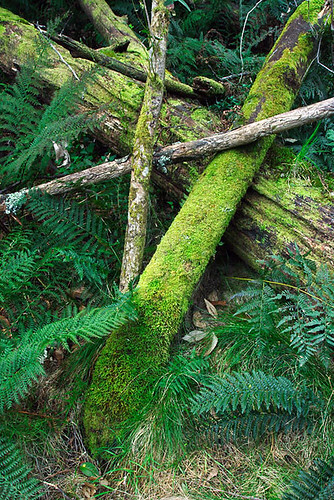 With the ever present Hanging Rock beckoning me, I chose to concentrate my photography on the landscape and trees. It was an excellent opportunity to use my 10-22mm wide-angle lens and create depth in the scenes. Being ever alert, Bronwyn spotted a mob of eastern grey kangaroos amongst trees in the grounds of the Hanging Rock racecourse. It would have been great to photograph the roos, but I was content to see them graze in the shade. Come 6pm, the sun was about to disappear and the golden hour was over. 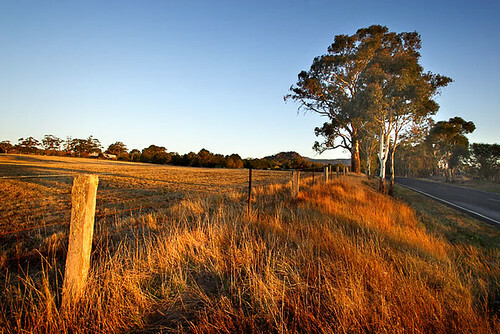 It was a delight to experience the landscape of the Macedon Ranges district and return home with some new photographs. What a privilege – the simple things in life are so often the best. 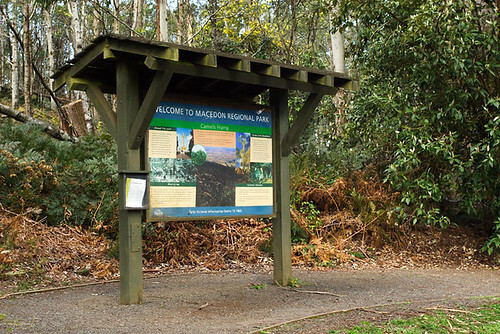 Located about one hour from Melbourne, the Macedon Ranges provides excellent opportunities for landscape photography and a great day out. The changing seasons around Macedon can see snow, the splendour of autumn leaves and magnificent morning and afternoon lighting conditions. 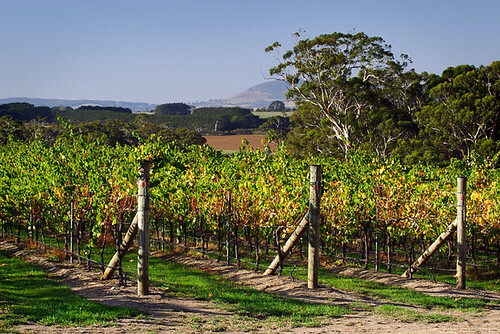 A journey in the region reveals magnificent towering gum trees, waterfalls, vineyards, volcanic rock formations, quaint villages and plenty of wildlife including rosellas and eastern grey kangaroos. A favourite bush walk of mine is to the top of Camels Hump as it provides a panoramic vista towards Hanging Rock and the surrounding countryside. 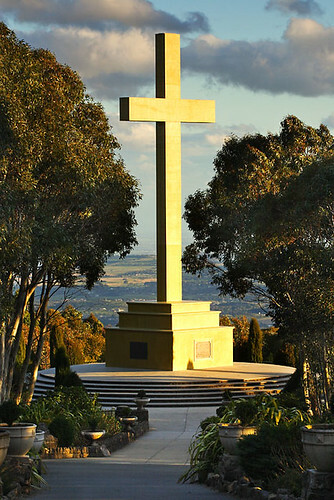 Nearby towns include: Macedon, Woodend, Gisborne, Kyneton, Malmsbury, Mount Macedon, Riddells Creek and Romsey. Take a mate and enjoy a picnic at the Hanging Rock reserve and explore the volcanic rock formation which rises 105 metres.